Totes don't come much cuter or quirkier than this Cloudberry bag from Mad Imports. The little tufts of woven raffia which dot the Cloudberry's body make this purse a textural marvel. These little nodules won't be to everyone's tastes, but nothing with personality ever is. Personally I think it makes a refreshing change of pace from your typical woven raffia bag, and I'm thrilled to see the effect continued on the back of the bag too! The colors are also so striking and fresh. Natural beige raffia is contrasted with more vibrant dyed blue, green, and mustard hues to create a cheery, summery rainbow. As with any raffia bag, it's worth noting the Cloudberry's limitations. The natural fiber is notoriously brittle, so you won't be able to load this tote up. Use it to carry the bare essentials only, and resist your natural urge to overstuff it, if you want to make it last. That lack of longevity may disappoint fans, but at least at $98 it won't cost too much to replace! 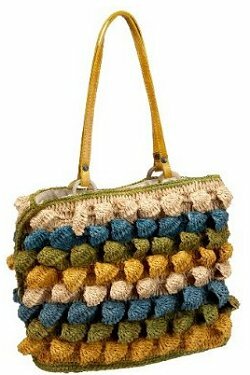 The Mad Imports Jujube tote bag, a great alternative to this quirky raffia bag.